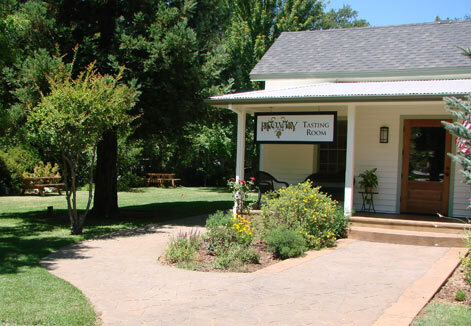 The Hovey Winery Tasting Room is located in the beautiful, historic setting of the 1850 Albert Michelson house in downtown Murphys, in the heart of California’s Gold Country in Calaveras County. Murphys was voted one of the top 10 “coolest” towns to live in, with more than 20 tasting rooms, unique boutiques, historic and contemporary lodging, community park set along the Angels Creek, and a bevy of delightful eateries all within walking distance. Hovey Winery was started in 2008 with the trailblazing effort of our founder and winemaker,Chuck Hovey, a pioneer in Sierra Foothill wine making. We invite you to taste our nationally and internationally acclaimed wines...and to join our Wine Club, of course. Our tasting room philosophy is simple – Linger Longer! Enjoy Hovey wines in the Tasting Room, at bistro tables and wicker love seats on the porch, or at picnic tables made by local high school students on the shady lawn. In addition to the Tasting Flights, wines are available by the glass or by the bottle. Closed Thanksgiving and Christmas and on Tuesdays in the winter.